The difference between owning that coveted yellow jersey and coming last place in the Tour de France can be a matter of 30 seconds, and according to Dr Scott Drawer, anticipation is everything. The challenge for the Performance Hub this year was to find new ways for its sports directors – the coaches who sit in the ‘follow’ vehicles and manage the race on a daily basis – to monitor the competition and communicate with cyclists. Typically each of the 22 teams of eight riders has its own radio frequency for the 3,500km race and they can communicate with support vehicles – which trail about 1km behind the peloton – via radio mic. However, as Drawer points out: “While we can radio riders, it’s harder when you can’t see what is happening and we are trying to make decisions in as close to real time as possible.” He also likens the process of trying to track the progress and conditions for a cyclist biking up a mountain as “like trying to direct a football match in the dark”. In-car portable TV sets broadcasting the live feed have been used, but in vehicles that are always on the move, travelling through cities, over farmland and up and down mountains in all weather, it can be difficult to get a signal. While a satellite dish on top of the car could provide the team with the constant connectivity it required, Drawer adds that in a vehicle already carrying nine bikes on the roof rack and, in the back, spare wheels, food and medical supplies and support staff, “space is a big issue”. Part of Team Sky’s remit is to find creative ways of resolving these kinds of challenges, often looking beyond its own specialism and towards the arts, music, sport, military and business for solutions. Working closely with its sponsor BSkyB’s mobile broadcast technology division, the team’s quest to find compact in-car connectivity led them to Dejero, a ten-year-old network blending firm based in Ontario, Canada. Perhaps best-known in broadcast streaming circles for its EnGo mobile transmitter, which enables journalists to broadcast high-quality video live with reliable connectivity, the Canadian firm also produces a router called GateWay. According to the firm’s director of sales for EMEA, Rob Waters, GateWay is typically used by broadcasters and media producers working from moving vehicles and to enable its truck engineers to remotely plug into bandwidth-guzzling media asset management systems. The router delivers high bandwidth connectivity to the internet, private networks and cloud services by blending 3G, 4G and LTE cellular connections from multiple carriers. Dejero’s own algorithms manage the fluctuating bandwidth, packet loss and latency differences of individual connections to choose the optimal path to route IP packets to their destination. The result is more bandwidth, speed and reliability over a secure connection. Dejero’s network blending technology permits the easy delivery of data in connection-challenged environments. It doesn’t matter if the data is video, audio, analytics or what have you. 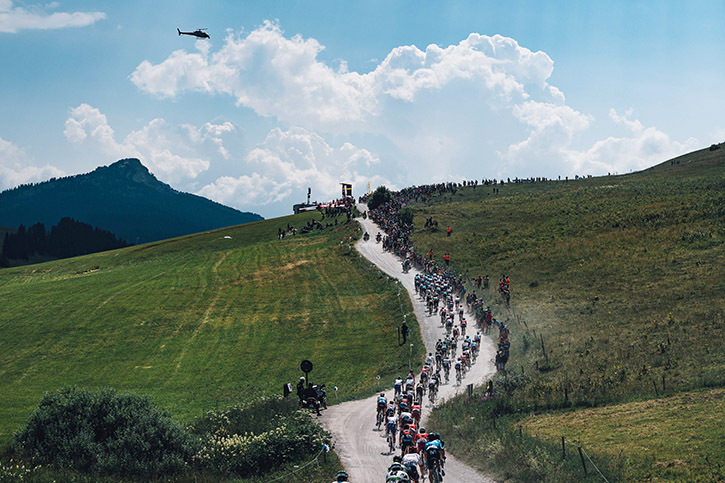 According to Waters, for the Tour de France, the GateWay used the bandwidth and capacity it typically provides for big outside broadcast clients to essentially create a series of internet hotspots. During the race, these ultra-reliable connections could be used to enable the support team to watch live video streams of the cyclists on their tablets from inside the vehicle and view the course ahead, as well as for tasks such as gathering weather data and monitoring social media feeds. the move, and Dejero was willing to go on that journey to help us improve connectivity,” he adds. The rack-mounted router was placed in the trunk of the support vehicle and trialled on several pre-event races. “The team supplied us with logs and data and GPS of where they were, so we could provide real-time support while they were on the road,” says Waters. Team Sky’s Geraint Thomas became the third Briton to win the Tour de France when he crossed the finish line in July this year, while his team mate Chris Froome came in third, making them the only team to have two finishers among the top five. In a race where every second counts, Dejero says that its technology shaved 15 to 30 seconds off the support vehicle’s response time. “Without a doubt it exceeded our current TV system, it worked as well as it possibly could have in terms of finding connections for us,” adds Drawer. He was particularly impressed with the quality of the connectivity achieved in crowded areas, which can prove to be a trouble spot with lots of fans connecting to devices and posting – sometimes very large video files – to online platforms. For Drawer and Waters, the project is still very much work in progress. Eventually, as communication infrastructure improves and 5G is rolled out, constant, high-speed connectivity will be possible. 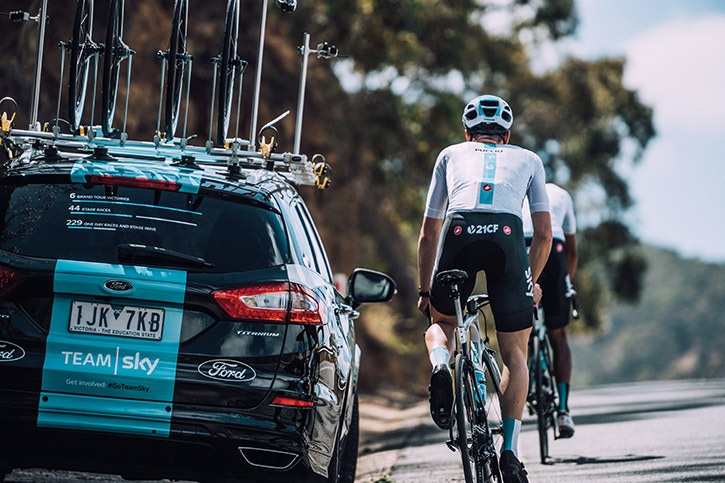 Until such time, Dejero and Team Sky are experimenting with a small satellite dish under the car bonnet and will use GateWay to connect to satellite broadband to help them achieve their connectivity goals. According to Waters, the manufacturer is continuing to hone GateWay’s software and hardware, improving its general strength and capability. “The unit used in the Team Sky vehicle had three modems, we now have six installed, which we’ve seen perform outstandingly in tests with the ability to reconnect quickly, so the existing product is only going to get better,” he says. Dejero is already working on future product developments, including making the device smaller, according to Waters. According to Waters, Dejero’s R&D efforts are already starting to pay dividends as its business opens up to a growing number of non-broadcast companies that require robust IP connections on the move. “Sports, music and live events companies have come to us with projects. At IBC we were even approached by a film company that wanted to be able to upload proxies of its daily rushes to the studio and build our technology into its DIT trollies, so they can move large files around while on the move” – a rush of new clients which must surely be the business equivalent of winning the coveted maillot jaune.